Daylight and sunlight are a single source of natural energy which we need to allow into our buildings through glazed apertures, as daylight for visual tasks, and sometimes as thermal energy for useful heat gains. Windows also provide a vital connection with the world outside. However, the energy density of daylight and sunlight varies over a huge range, and it has to be controlled to prevent overheating and glare. Solar Film can be used to control heat and glare. These heat reflective window films are designed to reduce solar heat and glare through glass, improving the ambience of workspaces, living spaces, classrooms and laboratories. 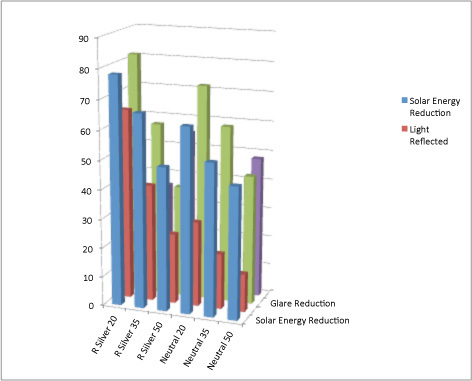 Solar heat gain and glare reduction of up to 90% can be achieved using Solar Control Window Film. Heat Reflective Window Film is a tried and trusted solution within thousands of businesses across the UK and are used by millions of organisations throughout the world to combat the effects of heat and glare from the sun. Additionally, Solar Film can also act as a Daylight One Way Privacy Window Film. Achieving one-way vision during daylight hours and protecting you and your valuables from prying eyes, while still allowing vision to the outside. Solar Window Film reduces the load on air conditioning and cooling units helping to reduce energy consumption and reduce carbon footprint. In the summertime, solar heat and glare can make life uncomfortable at the office, home or shop floor. As the temperature rises, working efficiency falls. Often hot temperatures bring out hot tempers. Even window blinds cannot keep you cool; they just keep out the light. Existing buildings can be transformed by the installation of Window Films. Window Film is basically a polyester product impregnated with a metal coating – either metalised OR sputted process – the mirror Window Film reacts to the strongest light source giving the effect of a reflective mirror or neutral grey look depending on the Window Film type and colour. From the outside, the strong light source of daylight where a person looking toward the treated window, will see a mirror or neutral grey while the inside view outwards is a slight window tint and visually transparent. Sureguard Window Films® provide varying degrees of window tinting to glass and thus reduce heat through windows. Many computer users experience discomfort and eye-strain caused by glare from the sun reflecting on their Visual Display Unit. This can have a severely detrimental effect on the efficient running and profitability of a company. Solar Control Window Films from Sureguard Window Films®, act as a powerful aid to minimise glare providing a far more comfortable working environment. Glare should be considered as part of any DSE (Display Screen Equipment) Work Station Assessment. Solar Control Window Films from Sureguard Window Films® can be a cost-effective way to reduce glare in any office environment. Solar Control Window Films from Sureguard Window Films® are available in Neutral, Mirrored, Silver, Copper, Grey, Green, Blue, Gold, Red and many more shades. Where ever possible Solar Control Window Films from Sureguard Window Films® are applied to the internal face of the glass, dependant on availability and compatibility with the glass to be treated. Solar Window Films are normally used in places where there is a need to reduce heat, glare and or add privacy. Ultra-Violet barriers in solar and neutral Window Films filter up to 99% of UV transmission protecting goods from rapid deterioration.